Revenue in the Small Cars market segment amounts to US$8,376m in 2019. From an international perspective it is shown that most revenue is generated in France (US$11,134m in 2019). The Small Cars Market segment includes economy passenger cars of an average footprint around 3.7m2 (40 ft2), an average mass around 1200kg (2680lbs) and a passenger/cargo volume between 2.4 m3 and 2.8 m3 (85 ft3 and 99 ft3). The Smalls Cars Market developed significantly in the late 1960’s and the early 1970’s as manufacturers responded to economic growth by offering a larger car alternative to a mini car. Although models of this kind existed from mid twentieth century on, small cars became especially popular around the turn of the century due to their fuel efficiency and a strong trend in retro-branding. Example Models: Citroën C3, Fiat Grande Punto, Fiat Punto Evo, Ford Fiesta, Hyundai i30, Kia Soul, Kia Venga, Lancia Musa, Lancia Ypsilon, Mazda 2, Nissan Note, Opel Corsa, Peugeot 207, Renault Clio, Seat Ibiza, Škoda Fabia, Suziki Swift, Toyota Yaris, Volkswagen Polo. 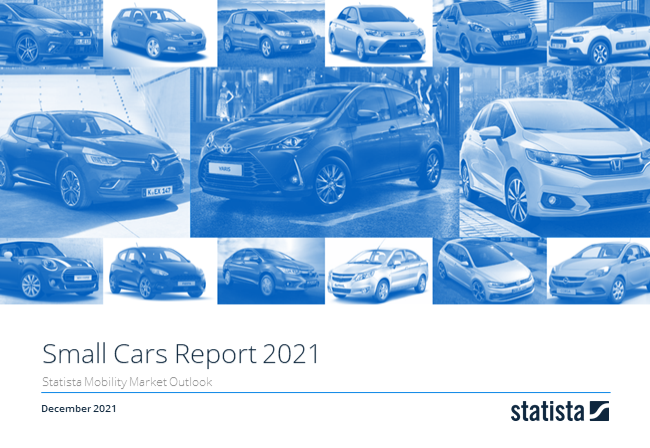 Reading Support Revenue in the Small Cars market segment amounts to US$8,376m in 2019. Reading Support In the market for Small Cars, volume is expected to amount to 698.5 t cars by 2022. Reading Support The average price per unit in the market for Small Cars amounts to US$10,402 in 2019. Reading Support With a market volume of US$11,134m in 2019, most revenue is generated in France. Here you can find more studies and statistics about "Small Cars".